The filter transform lets you filter for certain things in your data, effectively removing the rows from your data that you don't want to use. In my example, I want to see purchases that were over $150 on my website. Go ahead and click the Add Transform button, then select Filter Data. In the window that pulls up, we can select what column we want to filter and how we want to filter it. There are three fields you'll need to use in the Filter transform: Column, Operator, and Value. The Column field is where you choose what column you would like to filter on. You use the Operator and Value fields to specify the information that you do or do not want to see. So for my example, I choose the column Purchase in the column field. My operator is Greater than and I set the value at 150. This then filters out any data where the purchase was $150 or less. And that's it for filtering! 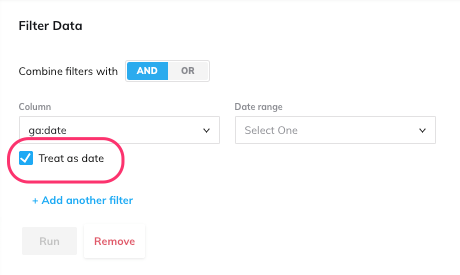 One note: if the column you choose to filter on is a column with dates, be sure to check the "Treat as date" checkbox below the column field. This will make sure that you get the right operators and values that are specific to date filtering. One common question is how to remove blank rows. The way this was solved was by using a filter transform and setting it not equal to blanks, or "" (two double quotation marks) . This will take out any rows that don't have any content.